Amid the upheaval at Tesla Motors last week, a milestone in the annals of the electric car went largely unnoticed. At Think Global’s factory in the Norwegian countryside, the first of the company’s battery-powered City urban runabouts rolled off the assembly line. A canary-yellow two-seater sporting baby-seal-eye headlights and a bumper-to-roof glass hatch, this first production Think City will go about 112 miles (180 kilometers) on a single charge. It’s zippy, fun to drive and could well be the Honda Civic for the age of global warming. Consider: Though ubiquitous now, the Honda Civic arrived on U.S. shores some three decades ago as a tiny, under-powered hatchback from a little-known foreign automaker in the era of the Detroit land yacht. Timing, of course, is everything. The Civic made its debut as the oil embargoes of the 1970s drove Americans from their gas-guzzling Chevys and Fords; and as an entire generation turned to the Japanese for economical well-made models, Tokyo gained a foothold in the U.S. market. In time the Civic morphed into a full range of vehicles and cemented Honda’s (HMC) hold on car buyers even as Americans returned to their profligate ways with the advent of the SUV. Think — and other electric car companies — finds itself at a similar inflection point. Gas prices are at historical highs and global pressure to cut greenhouse gases will inevitably fall heavy on one of the biggest carbon culprits, the internal combustion engine. The success of the Toyota (TM) Prius gasoline-electric hybrid is just a harbinger of the market for all-electric cars. Last May Green Wombat spent some time at Think in Norway and had a chance to test-drive a couple of the City prototypes. Last year Norwegian renewable energy entrepreneur Jan-Olaf Willums (center in photo above) and his investment group acquired Think and revived plans to produce a next-generation City with a next-generation business model. The Internet-enabled car will be sold online and seeded through car-sharing services like Zipcar. Buyers will purchase the car but lease the battery as part of a mobility fee that could include insurance and WiFi access. (The City will sell for about $34,000 in Norway and Willums is shooting for a U.S. sticker price of $15,000 to $17,000 plus $100 to $200 a month for the mobility fee.) Think has raised nearly $80 million from Silicon Valley venture capitalists and European investors to get the production line up and running. Green Wombat caught up with Willums over the weekend via e-mail to get an update on Think’s plans. According to Willums, General Electric (GE) is now an investor in Think and the company struck a deal with GE to collaborate on battery technology. The cars now coming off the assembly line will be put through their paces in the harsh Norwegian winter — a trial that bodes well for an eventual entry into the U.S. northeastern market — and will go on sale in Norway in the first six months of 2008. Those cars will be powered by a Zebra sodium nickel chloride battery. Earlier this year Think struck a deal with Tesla to buy a version of its high-powered lithium-ion battery packs that give its Roadster its zero-to-60 mph-in-four-seconds vroom. But Tesla put its battery business on hold as it focuses on getting the Roadster on the road. Willums says Think now will obtain lithium-ion batteries from A123 (which is working with General Motors (GM) on its Volt electric hybrid) and EnerDel. Think will begin testing those batteries in the City in the first half of next year. In 2009, Think will begin selling the City in other European countries. 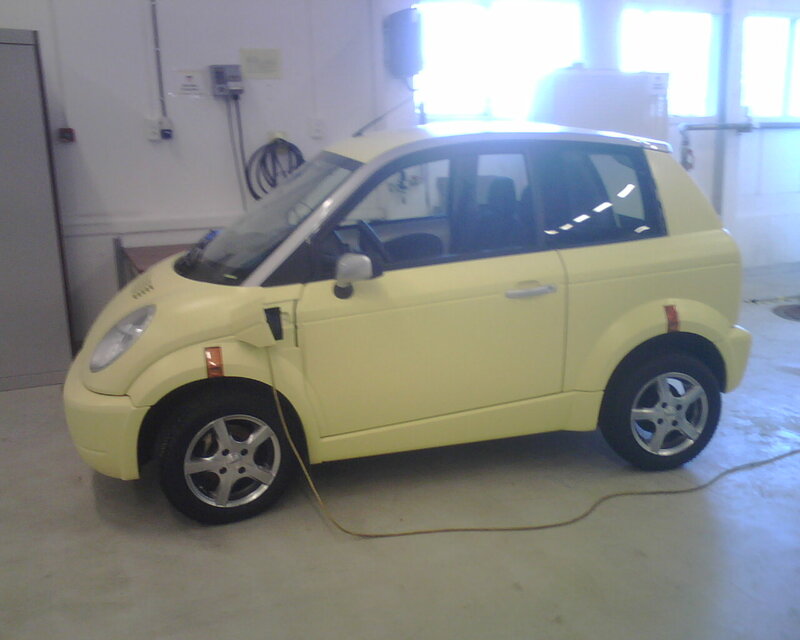 The cars sold in Norway carry a Web-enabled black box that transmits battery performance data to Think. Tbe ’09 model will be fully Internet-capable so drivers can communicate with their City and the car can ping its owner when, for instance, it needs maintenance. The road for Think is a long one and many unforeseen obstacles could crash its ambitious plans, which include introducing a family sedan. But like the Honda Civic of 1972, the 2008 Think City may be well just be the prototype of a new automotive model. You think you can put global warming in an article and people will read it??? I pucked up right away. People will buy a car that is large enough for them to fit in, and one that is convenient to drive, not to mention the price. I believe Honda shipped Accords first. Please chekc out the latest issue of Popluar Mechanics … 73 mpg VW diesel. Just read your story on the Honda Civic, and it’s dismal start in the States. You mention the 1970’s. I was a student at Michigan State during the early 1960’s. I remember seeing a cover photo Fortune Magazine of Long Beach Harbor CA. The entire cover was a shot of hundreds if not thousands of Hondas sitting on the docks. The article pointed out that the cars were sitting there because there were no dealers to sell them. Why do car companies make small cars more fuel efficient? Doesn’t it make sense to make vehicles that burn a lot of fuel be more fuel efficient? A two passenger car is not going to save the environment in America. Americans like b sedans, SUVs, pickup trucks, and sports cars. These cars have bigger engines and burn up more fuel. These are the cars that need to be made into electric vehicles. How can a family go around town in a two-seater with a three-cylinder engine? These environmentalists may have good intentions but the execution is horrendous. Darn – not going to hit our market for another 2 years or more eh? Well, rats. I would like to see one here now as I’d buy one even if it couldn’t go over 62mph. I seldom need to drive on the highway and the range would well meet my needs. I suspect there are many others like me that need a simple commuter car and a plug-in mode like this would meet the needs. Now, the cost model is what worries me the most – how much of a “green” premium is there going to be? I’m not willing to pay more for this than the basic transportation is worth (i.e. don’t bring me basic commute and run errands two seater for $15K+ and expect me to get excited to pay it). its nice to save on gas but the monthly $100 – $200 battery lease fee kinda blows it for me. not to mention the rise in my insurance and home electric bill. 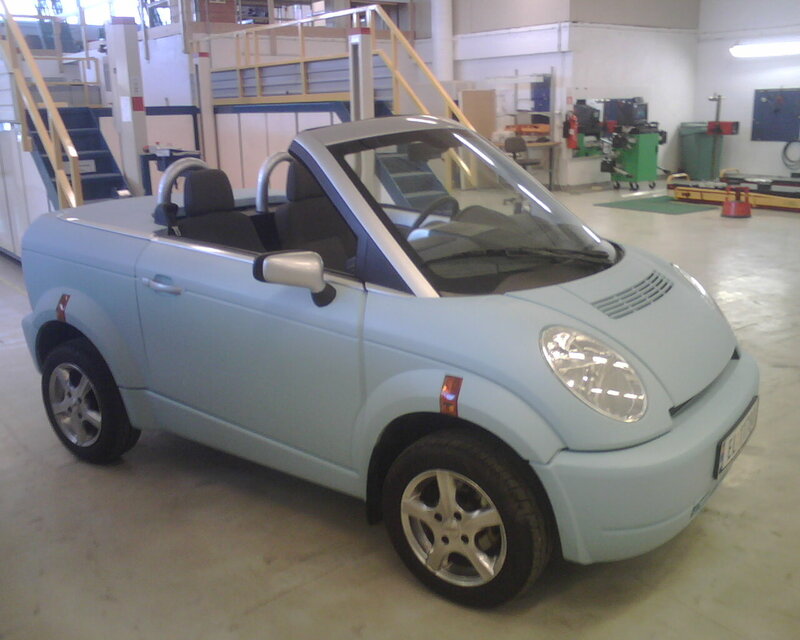 These “mini cars” that run on electric sound great in theory but how many people are going to love them in the real world? A top speed of 63mph, limited run time, minimal room and sparse creature comforts get old very quickly. Especially when people are used to driving around in a “living room on wheels”. I’ll keep my gas powered vehicle for as long as possible and let others suffer with these pseudo-cars. Honda started with the Civic and added the Accord later. Regardless of what the commenter said above, small cars offer the best opportunity to highlight high fuel economy because they are small. Big vehicles just can’t get great fuel economy BECAUSE they’re big. If it was just as simple as putting the electric motor in the vehicle to make it efficient, then many would have done it alreay. Bigger vehicle = bigger electric motor, bigger battery pack…much longer recharge time. Think about it. I’m starting to think that foreigner’s view of Americans is correct. Why do some of feel that’s owning the biggest vehicle on the road is necessary? My sister/brother in-laws just bought a new Sequoia. They don’t hunt, fish or off-road. Why did they buy it? Status. How pathetic! I have a minivan that I only use for trips with the family and a 1991 civic that get 39mpg that I use almost exclusively. The next time you’re filling up your fuel efficient car, thank the person next to you that’s filling up their oversized mode of transportation. They’re part of the reason why you’re paying so much to fill up. 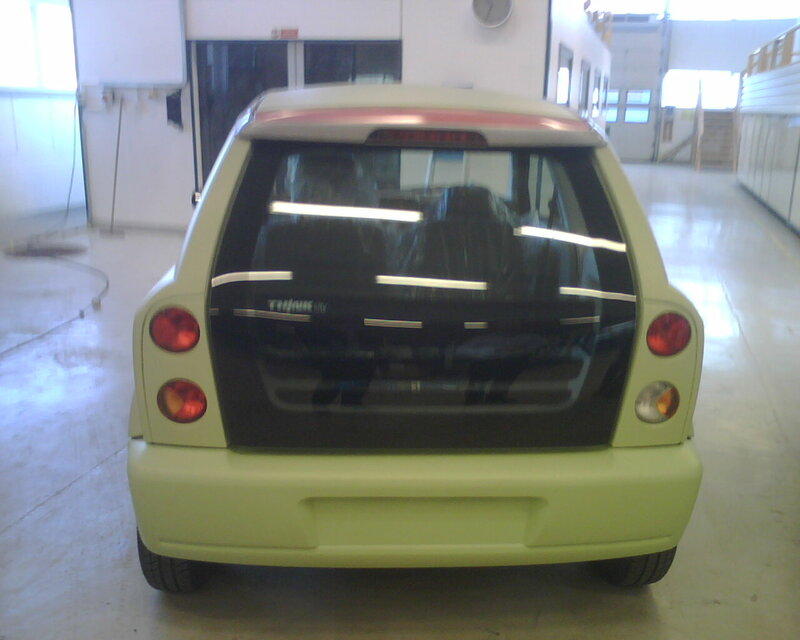 The reason that the GENERAL public would buy this car is to save, save and save. Yes, there will be people who think environment before their pockets but I don’t believe there are enough. Now if you tell me that you expect the average consumer to pay MORE for a smaller car and still need to pay $100 – $200 fee on the battery then that defeats any reason the general public would buy this car. In 10 years that would be $12,000 – $24,000 on the battery alone!!! Ouch!!! The reason that Honda and other small vehicles were successful was because the consumer saved money due to a savings on gas and the price of the car. IT’S SIMPLE ECONOMICS. Some of you may disagree but why do you think that the Hybrid cars have not taken off yet? Yes, with government rebates they do become more attractive. Again, consumer will focus on his/her pocket first. So far the big auto companies have put out there a simple BUT more expensive hybrid car for show ONLY. They know that if the hybrid is more expensive, it will take a long time before the switch happens, if it ever does. This is the same logic on these electric cars. Luckily for us, there is competition between the big auto makers plus there are other startup companies that are putting the pressure. A note on the present Hybrids: Not sure if it was calculated or not but the big auto makers should not have put Hybrids on models that are already out there. The reason is that the average consumer will compare to see if its worth buying a Hybrid Honda Civic compared to the gas version. That can’t attract the average consumer. They should have done like the Toyota Prius. Consumers couldn’t compare to a gasoline version because there wasn’t one to compare. That’s one reason it is the most successful hybrid. You need to somehow convince that this vehicle will save in the long run. Maybe it saves you on car maintenance? After saying all this, I really can’t wait for these cars to come BUT for them to be successful its simple economics. Maybe, just maybe, its just a matter of time. Do your math. First US Civic model was a 1973 Civic two door hatchback. First US Accord Model didn’t come until the 1976 model.